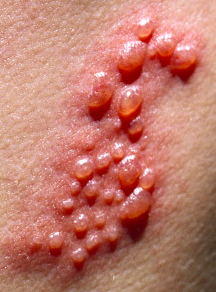 The varicella zoster virus, also know as the chicken pox and shingles virus, is a type of herpes virus. In younger people, it causes the chicken pox. The virus will then lay dormant in the dorsal root ganglion (bundles of nerves close to the spinal cord). Most young adults who are tested will demonstrate seropositivity to the virus – meaning that they carry the dormant virus and are at risk for it developing into shingles in older age. Our immune system will tend to keep the virus in check, however as we age, the number of circulating antibodies that are specific to the virus tends to drop, and the virus can reactivate. This results in a painful, blistering rash in a unilateral, single dermatome. Acute pain in the distribution of the dermatome usually precedes the rash by 7-10 days (1-3). The rash will tend to heal in 2-4 weeks, but roughly 10- 27% of sufferers will go on to develop a condition known as post herpetic neuralgia (PHN) (4). This is a nasty, painful conditions that proves very difficult to treat. The pain is described as being dull and constant or burning in nature, with many describing sharp, shooting pains as well. Some people also find the area to be intensely itchy. This is not a fun condition and the burden of disease is huge. The literature tells us that there are a few factors that can predict the likelihood of someone going on to develop PHN following the herpes zoster infection. These include older age, a worse rash in terms of pain levels and severity of the rash, diabetes and involvement of the eye (3, 5). Treating PHN is notoriously difficult. Success is generally defined as a 30% reduction in symptoms, however only about half of people treated for the condition will actually achieve this level of relief. (1, 2, 6, 7). The literature suggests that best treatment options are amytriptiline, gabapentin, lidocaine patches and perhaps even opioids. Many times, a combination of several medications is required to achieve better outcomes (1). Prevention is always better than cure and preventing PHN seems to come down to several factors. Oral antiviral medications are effective at reducing the duration and severity of the shingles virus. There is insufficient evidence to suggest that they are effective at reducing the development of post herpetic neuralgia, however there are some newer drugs on the market which are yet to be extensively investigated for their capacity to prevent the progression from acute pain to chronic pain (8). The problem in the real world with such an intervention is that it needs to be taken within 72 hours of the rash appearing to be effective. Patients may not present to doctor within that time, or the rash may be misdiagnosed. The most obvious way to prevent PHN, is to prevent the population from getting shingles in the first place. The shingles vaccine has been shown to reduce the occurrence of the virus by about 50% in a vaccinated population. Further, those who do get the disease following vaccination tend to have a milder rash and less pain (8, 9). Public health recommendations generally don’t support vaccination for people under 60. This is based on data that says that it is not cost effective – the costs of vaccinating a population under 60 do not outweigh the costs associated with not vaccinating (treatment, medication and ongoing costs in the event of post herpetic neuralgia). This is not the case in the population over 60 and it is generally recommended that people over that age get the vaccine (4, 10). However, we need to remember that public health decisions are exactly that – made for the public. For the individual, the opportunity to reduce the chances of getting shingles and the subsequent change of that hanging around and becoming PHN, the choice is a no brainer – get the vaccination, even if you have to pay for it. For primary healthcare practitioners, this is an easy chat to have with a patient over 50 that could save a lot of suffering for that individual. 1. Hadley GR, Gayle JA, Ripoll J, Jones MR, Argoff CE, Kaye RJ, Kaye AD. Post-herpetic Neuralgia: a Review. Curr Pain Headache Rep 2016;20:17. 2. Argoff CE, Katz N, Backonja M. Treatment of postherpetic neuralgia: a review of therapeutic options. J Pain Symptom Manage 2004;28:396-411. 3. Boogaard S, Heymans MW, de Vet HC, Peters ML, Loer SA, Zuurmond WW, Perez RS. Predictors of Persistent Neuropathic Pain–A Systematic Review. Pain Physician 2015;18:433-57. 4. Drolet M, Oxman MN, Levin MJ, Schmader KE, Johnson RW, Patrick D, et al. Vaccination against herpes zoster in developed countries: state of the evidence. Hum Vaccin Immunother 2013;9:1177-84. 5. Forbes HJ, Thomas SL, Smeeth L, Clayton T, Farmer R, Bhaskaran K, Langan SM. A systematic review and meta-analysis of risk factors for postherpetic neuralgia. Pain 2016;157:30-54. 6. Furlan AD, Sandoval JA, Mailis-Gagnon A, Tunks E. Opioids for chronic noncancer pain: a meta-analysis of effectiveness and side effects. CMAJ 2006;174:1589-94. 7. Finnerup NB, Attal N, Haroutounian S, McNicol E, Baron R, Dworkin RH, et al. Pharmacotherapy for neuropathic pain in adults: a systematic review and meta-analysis. The Lancet Neurology 2015;14:162-73. 8. Chen N, Li Q, Yang J, Zhou M, Zhou D, He L. Antiviral treatment for preventing postherpetic neuralgia. Cochrane Database Syst Rev 2014:CD006866. 9. Gagliardi AM, Andriolo BN, Torloni MR, Soares BG. Vaccines for preventing herpes zoster in older adults. Cochrane Database Syst Rev 2016;3:CD008858. 10. Le P, Rothberg MB. Cost-Effectiveness of Herpes Zoster Vaccine for Persons Aged 50 Years. Ann Intern Med 2015;163:489-97. This entry was posted in Uncategorized on September 29, 2016 by beyondmechanicalpain.